Colleague Emily Anderson in the Tioga State Forest observing current development activity. Now today, history is on the verge of repeating itself with a well-funded industry buying itself a prominent voice among decision makers, and budget short-falls afflicting the entire machine of government. Already, Governor Rendell has required the DCNR to provide millions dollars to the general fund, such as in the FY2009-10 Oil and Gas Lease Sale. According to the State Forest Environmental Review published on November 9, 2009, the agency was compelled to lease more land “due to projected shortfalls in the Commonwealth budget.” The report goes on to say that, “while the decision to conduct this lease sale was based on legislated requirements to generate bonus bid revenues of $60 million for the inclusion in the FY 2009-10 General Fund, this Oil and Gas Lease Sale conforms to the Bureau’s stated policy and goals.” Grudgingly conceding this mandate, the agency is trying to hold the line now. 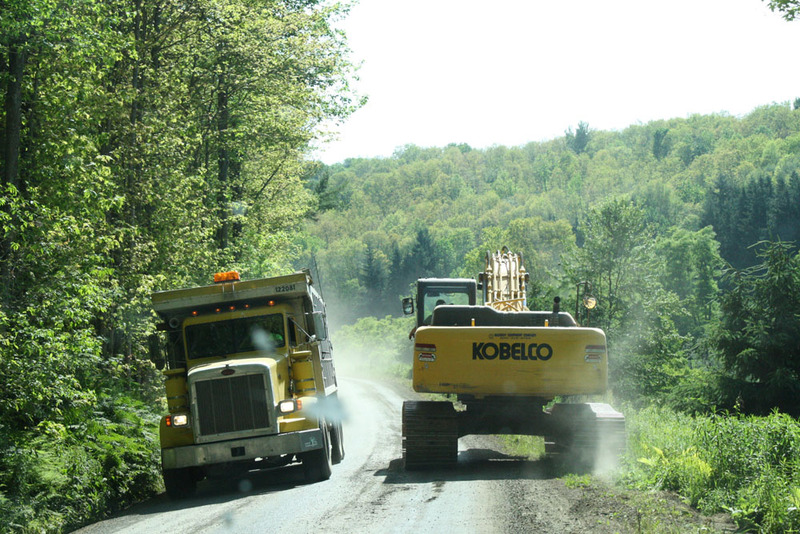 Heavy equipment clog the roads, but this is only the beginning of projected activity. The truth, however, is that there is little evidence for a best-case-scenario world with only the occasional, unavoidable accident. In the past 2½ years, gas drillers have accumulated nearly 1,500 violations, 952 of which have been deemed likely to impact the environment. These violations, tallied by the Pennsylvania Land Trust Association, range from improper plans and violations of PA stream laws to 10 cases of improper well-casing construction (the cause of well contamination in Dimock, PA) and 16 citations for improper blowout prevention (the very same shortcut that caused the Deepwater Horizon disaster in the Gulf of Mexico in April 2010). Furthermore, these are the violations that under-staffed and over-scheduled inspectors have managed to catch, one can only speculate what goes unseen. After spending the majority of a summer spent juggling phone calls, emails, maps, reading government documents and the flood of news articles emerging daily regarding the Marcellus Shale, and even pushing a mountain bike up hills and rattling down dusty gravel roads in the heart of drilling country, I cannot get away from the Marcellus Shale, even at home. The house I was raised in also lies in the Marcellus Shale fairway, in the mountains of the westernmost end of Maryland, Garrett County. Given that the northern end of the county where I live is largely focused on recreation at the Wisp Ski Area and Maryland’s largest man-made reservoir, Deep Creek Lake, it’s unlikely that any well heads will be poking up near my backyard in the near future, but the potential is there. In a conversation between the Maryland’s Department of Natural Resources and Pennsylvania’s DCNR, one Maryland official reportedly muttered “Holy s—” under his breath in response to what his Pennsylvanian colleagues had to say about the gas boom.